However every thing has been converted over to blender cycles. I have been playing around with the Interceptor Class mesh I did years ago to learn more about blender. So far this conversion in addition to just basic texturing it also included UV'd registry (never done that before) and driver controlled lighting. So for a change the ship in drydock is "off". 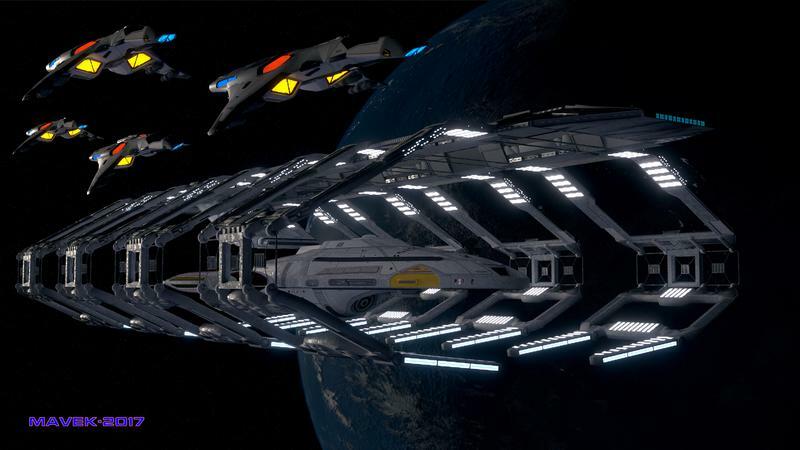 Also not shown here but the nacelles are also animated, but that was also true in the lightwave version. Also included is the blender cycles re-textured nemesis dry dock and the gyphon. I thought of adding another background ship or two, but felt the image was getting too busy as it was. I always loved this drydock, so much funky lightly comes from the mesh it self. And the gryphon mesh is always a favourite of mine which I can never get enough of.